Pinterest's traffic jumped 50% between January and February. 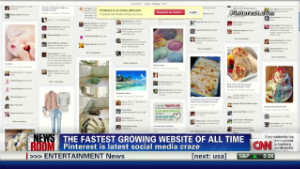 The report calls the site "the hottest social media start-up since Facebook and YouTube." Last month, Facebook had more than 7 billion total visitors; Twitter had 182 million; and Pinterest had 104 million total visits from people in the United States, according to data sent to CNN by Experian. That ranking puts the newbie site ahead of heavyweights such as LinkedIn, Google+, MySpace and Tumblr. One caveat: Since the data doesn't include mobile traffic, sites such as Twitter, which sees much of its traffic from smartphones and tablets, may take a hit in this ranking, Tatham said.